Sciatica refers to leg pain as a result of inflammation of one of the nerve roots that make up the sciatic nerve. At each level of the spine, nerve roots come off which transmit motor Back Pain Treatment Las Vegasand sensory impulses. At the lowest levels of the lumbar spine, multiple nerve roots combine to form the sciatic nerve. This includes the L4, L5 and S1-S3 nerve roots. So when an individual is experiencing sciatica, it is not really compression of the sciatic nerve itself, but rather one of the nerve roots that combines with others to make up the sciatic nerve. At any one point in time, one percent of the US population is suffering from sciatica. This amounts to over 3 million people and makes it a very common condition. What actually causes the pain from Sciatica? 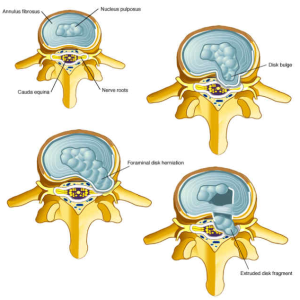 The most common reason that people experience sciatica is due to a lumbar disc herniation. 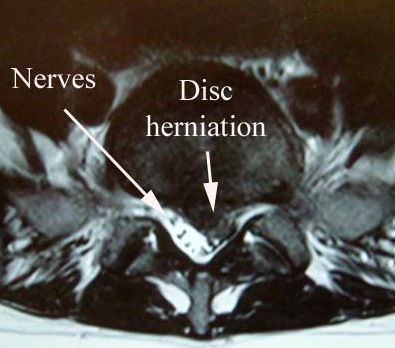 This is when a piece of disc sqeezes out from its normal confines and causes a pinched nerve. Normally, nerve roots come off from the spinal cord and exit the spinal canal with plenty of room. However, when a disc herniation is present, it may compress that nerve as it tries to exit. Compression of a nerve by itself is not painful. It may, however, lead to significant inflammation around the nerve roots and that is actually what leads to sciatica. Another condition that can lead to sciatica pain is spinal stenosis. This is when arthritis of the spine leads to overgrowth of bone and soft tissue around the nerve roots that can pinch nerves as they try to exit from the spine. This may cause sciatica. Additionally, when an individual has degenerative disc disease and tears in the outer part of the disc it can lead to a chemical flare up with inflammation that can also present as sciatica. In this situation, there actually is no disc herniation or nerve root compression, however, the significant inflammation from the disk there can inflame the adjacent nerve root. Not every individual with sciatica walks right out of a textbook. Depending on which nerve root is actually being pinched, that will determine where the pain is experienced. For instance, if an individual has compression of the L4 nerve root, it may cause pain that goes down outside of the thigh and onto the front of the calf and foot. With compression of the S1 nerve root, it may cause pain down the back of the leg and calf and onto the outside or bottom of the heel. There also may be associated numbness, a pins and needles feeling, and at times motor weakness may be present such as a foot drop. Most commonly, the patient’s history is indicative of the problem. Physical exam may show what is called nerve root tension signs where lifting the affected leg is very painful and bending it relieves the pain, as tension is taken off the nerve root. X-rays are not very helpful for sciatica, and an MRI typically shows the problem very well. It may show a significant disc herniation, significant spinal stenosis, or there may be disc degeneration with an annular tear but no evidence of nerve root compression at all. What are the best Sciatica treatments? Initially, treatment should be nonoperative. This may include over-the-counter anti-inflammatories and Tylenol, along with muscle relaxers and opiate medications from the Las Vegas Pain Management Doctor for short-term use. Along with these medications, physical therapy or chiropractic treatment may help relieve pressure off the nerve root and a TENS unit may relieve symptoms as well such as from muscle spasms. One treatment that has been showing increasing promise in Pain Management is spinal decompression therapy. This involves intermittent spinal traction that can decompress the nerve roots that are being pinched. The standard for Interventional Pain Management is epidural steroid injections. These are outpatient, low risk procedures where steroid medication is placed around the area of nerve root compression. There are three different types of epidural injections. All these are most commonly done under fluoroscopy, which is a real-time form of x-ray. Studies show that without fluoroscopy, up to 40% of epidural injections are placed in the wrong area. Interlaminar epidural injections have been performed for over 60 years and involve steroid medication being placed over the area where the nerve roots come off of the spinal cord. Transforaminal epidural injections are the newest method and involve the needle being placed closer to the actual area of nerve root compression as they try to exit out the spinal foramen. 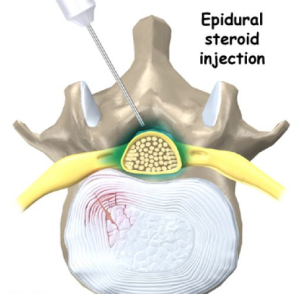 The third method of an epidural injection is called a caudal epidural steroid injection. For this injection, steroid is placed through the sacral hiatus, which is at the lowest portion of the lumbar spine. With these injections, multiple areas can be treated at one time which is great for a condition such as spinal stenosis. With spinal stenosis, multiple nerve roots may be getting pinched at the same time so treating them all with one injection is preferable. How well do Sciatica treatments work? Over 90% of the time, sciatica it can be treated nonoperatively. Epidural steroid injections have been shown to work well over 75% of the time. It may be necessary to perform a series of three injections over a six-week period. Those can then be repeated every few epidural steroid injectionmonths. A landmark study in the Journal of the American Medical Association looked at nonsurgical outcomes versus surgery for lumbar disc herniations with sciatica. Studies show that at the one year point, the results were no different. Therefore, if pain can be controlled without surgery it’s preferable. When should surgery be performed for sciatica? If the patient has a motor deficit such as a footdrop that is not getting better over 6 to 12 weeks, then surgery is indicated. If a motor deficit is progressively getting worse, then surgery is indicated even sooner than that. If Pain Relief is not being achieved over a 6 to 8 week time period, then surgery is indicated for pain relief. There is also an emergency indication called cauda equina which is where significant compression is being seen with loss of bowel and bladder function. For that, surgery shoulder be performed on an emergency basis within 24 hours. What are the risks of sciatica treatment? The main risk of nonoperative treatment is simply that it will not work. Physical therapy and chiropractic treatment carry with them minimal risks, and epidural steroid injections have minor risk of elevated blood sugars and weight gain that is usually transient. There could also be nerve injury or some bleeding. 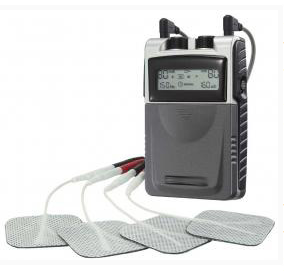 The risk of tens units is minimal and they should not be worn continuously but rather for a couple hours on and then off. The bottom line with sciatica up is that most of the time, Las Vegas Pain Clinics do extremely well at achieving Pain Relief in patients without surgery. With the various options for treatment available including medication, PT, chiropractic and injections, as mentioned pain relief is achieved well over 90% of the time successfully.